Spring semester has been really tough and I’ve been through a lot in the past several weeks. The semester is finally over, and I’m back in California for the next couple of weeks. Honestly, I’ve never worked so hard in my life. I studied constantly, almost every day in the entire semester. I did really well in the beginning of the semester, and then I hit my breaking point right about when I made that last blog post. I studied really hard for the 2nd Neuroscience exam. I had prepared for 1.5 weeks in advance, and must have studied for 25 hours the weekend before the exam on Monday. I was completely burned out after that, mentally and emotionally. My boyfriend broke up with me that week, and I couldn’t focus in class for a few days. He’s also a first year, so seeing him every day was rough for a couple weeks. I tried to focus on studying for the next Kinesiology exam, but I could not focus on anything because there was a ton of stuff going on in my life. It felt pretty terrible to not really study for an exam, especially because I love Kinesiology and wanted to fully understand all of the material before the summer semester began. I still managed to do well, but I wasn’t proud of the amount of effort I put in. I was still dealing with the bugs in my bedroom. I eventually called an exterminator and that solved the issue. They were coming in from the outside, and they’re incredibly tiny bugs, so it’s impossible to seal the walls to physically prevent them from coming inside. I’m crossing my fingers that the bug spray will last a while because my landlord did not cover that expense. I went to a restaurant to study with a few classmates. 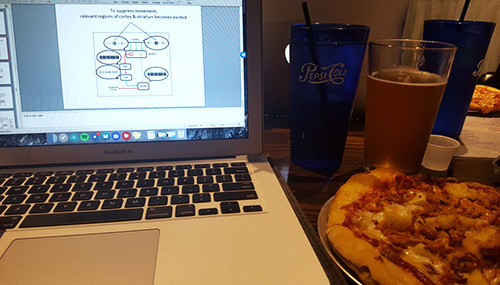 We got pizza and beer, and unsurprisingly it wasn’t the most productive atmosphere, but we did get through 100 Powerpoint slides that day! The last several weeks of the semester were incredibly stressful. Well, basically the 2.5 months after we returned from spring break. About 6 classmates had a D in Neuroscience, so everyone was worried and trying to help them out. Basically everyone was stressed about something, even if they had good grades already. Our final schedule was strange this semester. We had Exercise Physiology on a Monday, and we learned new material for Neuroscience and Research Methods on that same Monday and Tuesday. Then we had a review session for Kinesiology on Wednesday. Then we had one final on Thursday, two finals on Friday, one final on the following Monday, and then two finals on Tuesday. To make that less confusing, we had 7 finals in 8 days. So on Monday morning before the Exercise Physiology final, I woke up at 6am to a text message from my sister. She told me that my grandpa had a heart attack, and he probably wasn’t going to survive. I freaked out and started crying, and tried to get more information from her. I tried calling my parents but they were driving to the hospital, and it was 3am in California at the time. I woke up and tried to study for my final, but could not focus on anything. I ended up walking to another classmate’s house and talked to him for a few hours before we left for school. My grandpa ended up going home later that week, but I really struggled with focusing on studying. I hadn’t spoken to my grandparents since I went home during the holidays, and I just wanted to speak to them and visit them as soon as possible. I felt incredibly guilty because I had been planning on calling them, but never actually called them, and I was worried that I would never be able to speak to him again. I ended up studying in the library from Monday – Thursday that week. A bunch of my classmates studied at the same table, and I think we had 12 of us studying there at once. We all brought snacks and were sharing, and it was so great to be able to ask questions whenever I was confused. We also would take breaks to get dinner, or we would just take a couple laps around the library to clear our heads and not talk about school for a few minutes. There is a whiteboard in the library, so we drew on it a lot to study. 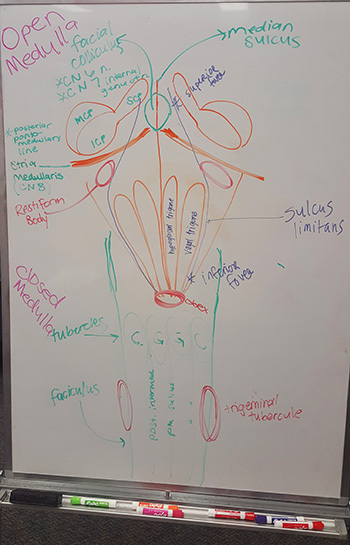 This is a picture of the brainstem, and we were studying for the Neuroscience lab practical. I brought chocolate to the library, and I got this wrapper twice! 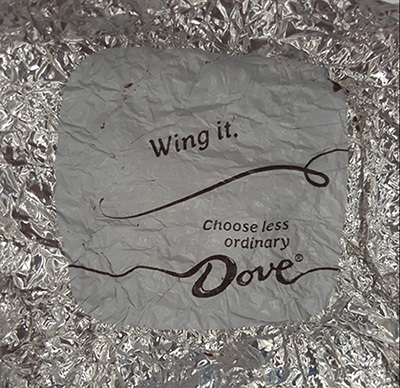 I definitely took Dove’s advice and winged a few finals. One of my classmates counted 1,700 Powerpoint slides that we had to learn just for finals. 1,700! I’m not joking. The finals were not cumulative. I can’t imagine how many Powerpoint slides we have learned for the entire semester. Some classes were good about testing more of the concepts, but the others basically expected you to memorize every single word on the slides. Those classes had curves so they weren’t impossible, but I honestly felt like I failed two of the finals. I ended up getting passing grades on them somehow. We also got our mentees for next year! Every first year student is assigned a second year mentor. I live with 2 second years, so I didn’t really talk to my mentor, but I know that several pairs talked often throughout the fall and spring semesters. My mentee is also from California, and I’m excited to meet her. It’s crazy to think that we are almost second year students. It feels like we’ve learned so much information in a short amount of time, but it also feels like I know absolutely nothing at the same time. We threw a barbeque the day after finals to celebrate the completion of the Spring semester. It was a lot of fun, and some people burned their notes in the fire pit. The ex-boyfriend and I are also working things out, so stay tuned for more relationship gossip. 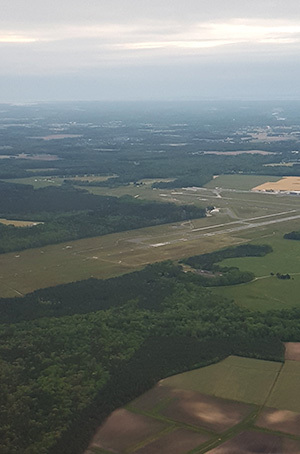 This is a view of the Salisbury airport. I tried to find my house from the plane but we flew the wrong direction. I did take a photo of a brewery that my classmates and I have gone to a few times. I’m so glad to be back in California. I finally got to meet my niece and she’s so adorable! I’ve been taking plenty of photos for my classmates to see. I was able to visit with my grandparents for a few days so far, and I’m planning on seeing them next week too. There are a lot of people that I need to spend time with. I thought I would have enough time to re-watch the Game of Thrones episodes, but I have less free time than I thought that I would have. I had to add this photo. I saw it on my Facebook and laughed about it for days. 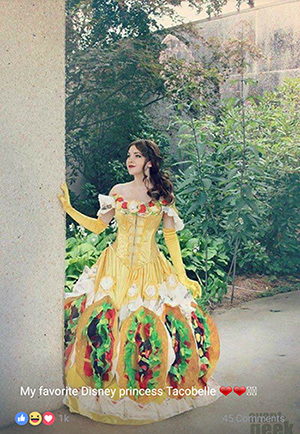 I can’t see a Taco Bell without picturing this anymore. Does your program also utilize mentors? Do you thing that it’s beneficial?